Ask American bankers the underlying principles of their work and you will hear common themes: stimulating the economy, creating jobs, helping people succeed. Ask bankers in Kenya, Jordan or Albania, and you’ll hear the same thing—but their financial environment is starkly different than that of the United States. 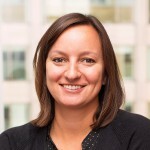 The Financial Services Volunteer Corps—a 25-year-old nonprofit that connects banks and regulatory agencies in developing countries with partners and expertise in developed markets—has a mission to help countries like the ones mentioned above create and sustain stable financial frameworks and practices. FSVC sends volunteer experts in financial services to emerging markets around the world to carry out this mission. “My first experience with FSVC was as a volunteer,” recalls Andy Spindler, FSVC’s CEO. Then an SVP at the Federal Reserve Bank of New York, he journeyed to the former Yugoslavia during FSVC’s infancy to help the country set up market-based financial systems after the fall of communism. “It was as if my entire career had been a prologue to giving this knowledge back,” says Spindler, who has led the organization since 1993. To date, FSVC has leveraged nearly $90 million in funding from the U.S. government, private foundations and other sources—sending more than 8,500 experts on more than 2,700 missions in more than 35 countries to help build sound financial systems in emerging markets worldwide. Building these systems requires a back-to-basics approach. In developing countries with very few banks and histories of lending only to the wealthiest subset of the population, support for small-to-medium enterprises is often lacking. But these markets are key to long-term job creation, economic growth, healthy competition and innovation. As FSVC volunteers develop new policies and procedures for emerging markets around the globe, they draw from the fundamentals they learned back home in the United States. This was Dev Strischek’s task in 2009 in Morocco. Strischek, SVP and senior credit policy officer at the Atlanta-based SunTrust Banks, spent a week in Casablanca working under FSVC’s direction with a primary bank ordered by the king of Morocco to establish new lines of business serving smaller commercial entities—a far-reaching objective for a country that had never before had such policies in place. “We were, in essence, systemizing the entire lending process, while working through the country’s legal systems,” explains Strischek. At the time, Moroccan banks had few if any customer credit histories, recording processes or even experience lending beyond a banker’s kin. “Lenders had a personal knowledge of the borrower, but collateral was complicated,” Strischek says. Strischek and FSVC started by teaching the bank how to implement an effective credit-approval process before moving to underwriting standards. This proved a challenge, since businesses lacked documented financials. The volunteer team’s recommendations included understanding, budgeting and tracking the borrower’s financial position. “Most of the teachings are really back to basics,” explains Strischek. In Azerbaijan, located at the crossroads of Europe and Asia, an economic transition is happening as the country moves away from Russian influence and an oil-driven economy into a diverse, rapidly growing market. To aid in this transition, FSVC helped a private bank in the capital, Baku, home to a quarter of the country’s population. The bank needed to become more efficient in underwriting, approving and monitoring smaller loans, so credit risk management was a priority. 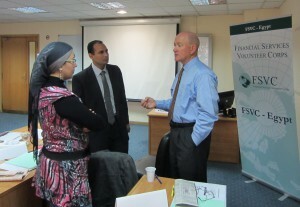 David Streeter of Umpqua Bank chats with local bankers during an FSVC trip to Egypt. David Streeter—SVP and credit administrator in Umpqua Bank’s Roseville, Calif., market—spent a week with the Azeri bank in early 2014, one of three trips he has completed as a volunteer for FSVC. With a goal to “steady the process of credit underwriting,” he and a co-volunteer delivered credit risk management recommendations to the bank based on fundamental lending processes practiced in the U.S. He and the team began their assessment weeks before arriving in Azerbaijan. With FSVC staff, they conducted cultural and economic research, interviewed bank management and staff to understand current credit risk practices and policies and developed presentations and lessons to deliver during the on-site portion of the project. The bank had a retail presence with storefronts and regional branches, but loans were not vetted by anyone in the management group of the commercial banking department prior to being submitted for approval. A key lesson for the bank was to demonstrate how different departments can work together to successfully underwrite and close a loan. In Angola, which emerged from civil unrest only a decade ago to become one of Africa’s fastest-growing economies, retired banker Robert Rout led by example. “There are more similarities than differences between banking internationally and our system here in the U.S.,” he says. Rout, who ended a 40-year banking career in 2014 as CFO of First Commonwealth Financial Corporation in Indiana, Penn., has brought his expertise on operational efficiency to six FSVC initiatives to date. Together with fellow volunteers, Rout traveled to Angola in 2014 to help address economic inefficiencies resulting from the rapid growth. Rout helped develop credit underwriting standards for a bank in Angola, where previously no tax documentation or credit reporting system had existed. He taught strategies like using personal collateral, standardizing small business products, loan authority delegating and monitoring the borrower’s cash deposits to the Angolan bank. “It almost goes back to the character loans we used to do before the advent of automated credit scoring systems,” he explains. Rout has also volunteered in Casablanca and with the Central Bank of Iraq. And First Commonwealth has since hosted two female lending executives from Kazakhstan, who rotated through each department of the bank. In 14 days, the visiting bankers dove into the technicalities of underwriting, retail operations and strategic planning. And the benefits are not one-sided. “Our volunteers are going to be amazed,” promises Spindler. “You start to reflect on not only how we bank here at home, but why we are bankers in the first place.” These discoveries have led FSVC’s committed pool of volunteers to a richer understanding not only of similarities among banking institutions worldwide, but of the value American bankers can bring to developing markets. “You’re helping build an economy,” says Spindler. And that’s a lesson worth teaching.